It’s been a great year in the Irish culture blogging world. I, for one, have been enjoying all the wonderful Irish content that my blogging buddies from around the web have been churning out for us. Below, you’ll find a few of my favorite posts from those Irish Culture Blogs. I hope you enjoy them, and I’m sure you’ll find many quite useful. As usual the guys at the Irish Fireside have come up with the goods. There’s always plenty of good content, prizes to be won, and all round interactive fun on their blog. Heading to Ireland for the Gathering? Take a read of their 5 tips for choosing a tour in Ireland. Mairead, at Irish American Mom, always throws up some of the best Irish recipes on the web. And I know you’re going to enjoy how they’re presented in photos and with a little bit of story telling. For starters, try out this Potato and Leek Soup recipe. Take a trip around Cork city with Susan over at Vibrant Ireland. With a strong Kilkenny connection, this is a handy blog to keep in touch with for some of the festivals and other goings on around Ireland. Want to know what to expect when you book a B&B in Ireland? Read what Stephanie has to say about that. Dig deeper into Infinite Ireland to fill up on other trip-planning tips for your dream holiday to Ireland. A new favorite of mine…Paddy, at Paddy’s Wagon, won a trip from New Zealand to Ireland! How cool is that. Her way of giving back, was by creating this informative and photo-filled blog. Like me, I’m sure you’ll spend plenty of time roaming around her blog, but I’m going to start you off with some beautiful pictures of the Giant’s Causeway and the North Antrim coast. Spending time in Dublin? Take Emily along as your tour guide. Or try out her One Day in Dublin series of posts, for some ideas on where to visit. Another recipe. This time one of Ireland’s most famous drinks – an Irish Coffee from Irish America. 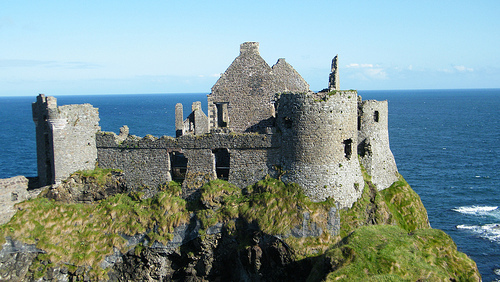 Irish traditions and customs abound in this blog. Felicity is a professional writer, and lives on the Dingle Peninsula in Ireland’s southwest coast, in Co. Kerry. Here, you’ll learn a little bit about Irish pubs, the meaning behind their names, and you’ll get a few tips on how to join in on a trad session. You’ll even pick up a few Irish words along the way. A funny, quirkey, Donegal girl is behind this blog. With a clear love of her native county (congrats on the Sam McGuire 🙂 ) you’ll find some very enjoyable posts on her blog. If Donegal is on your travels, see what this beautiful north west county holds in store for you in the way of delicious Irish food. You’re gonna like this one. A real treasure trove of information on Irish History. I’m going to give you the link to 5 Myths of Irish history (very interesting), but make sure you take some time to read some of the other posts (there’s plenty on Medieval Dublin), and be sure to listen to a couple of the podcasts too. Oh yes there is! But as the title reads, this is only ten of the best Irish culture blogs and posts. If I didn’t include your blog, or one you spend some time browsing, share a link from it with us, below. Another great list from Got Ireland! Thanks for including Infinite Ireland. You have listed some of the best culture blogs out there—I absolutely adore Emily’s, of From China Village, posts about Dublin and Felicity Hayes-McCoy’s posts about Dingle. Of course each blog you listed does something right, we follow them all! I just saw this, thanks Liam! And thanks, Stephanie! Happy New Year and looking forward to more Irish fun in 2013!